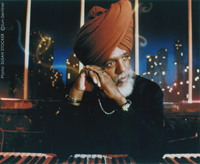 Dr. Lonnie Smith is an authentic Master of the Hammond B3 organ. For over five decades he has furthered the sound of Jazz Organ, created a worldwide fan-base, and revealed his musical talents on over seventy albums. Today, his name is truly synonymous with the instrument. Jazz Times magazine recently described him as “a riddle wrapped in an enigma wrapped in a turban!” This kind of description suggests the level of complexity that he exhibits in his music and the pure amazement that it elicits. Much has been written about his music…but just who is Dr. Lonnie Smith? Lonnie Smith has consistently been a leading force in jazz since 1969 when critics for Downbeat magazine hailed him as ‘Top Organist of 1969.’ More recently he has been selected as ‘Organ Keyboardist of the Year’ by The Jazz Journalist Association in 2003, 2004 and 2005. Born in Buffalo, New York, Lonnie was blessed with the gift of music and gained an exposure to gospel, blues and jazz through his mother at an early age. In his teens, he went on to sing in several vocal groups including his own, “The Supremes,” formed long before Diana Ross used the name. Lonnie also played the trumpet at school, and was a featured soloist, but upon possessing his own organ he immediately immersed himself in studying it with no instruction other than Jimmy Smith and Bill Doggett records and paying rapt attention to the church organ. Within months his proficiency attracted the attention of local musicians and so began his ascent into jazz history. Lonnie first gigs were played at Buffalo’s hottest club, The Pine Grill where he quickly came to the attention of musicians Jack McDuff, Lou Donaldson, George Benson and the agent Jimmy Boyd—who signed Smith to record with Grant Green. Soon after he moved to NYC and began playing regularly in George Benson’s Quartet. His reputation as a self-schooled innovator grew rapidly during his tenure with Benson, and eventually Smith went on to make his first recording as a leader on Columbia Records. After performing with Lou Donaldson and recording the seminal jazz gem “Alligator Boogaloo,” Smith was signed to Blue Note Records. Lonnie has recorded and performed with Randy Brecker, John Abercrombie, Marvin “Smitty” Smith, Ronnie Cuber, Kenny Garrett, Lenny White, Reuben Wilson, Lee Morgan, David ‘Fat Head’ Newman, King Curtis, Blue Mitchell, Joe Lovano, Jimmy McGriff, Frank Foster, Ron Carter, Grover Washington, Jr., Dizzy Gillespie and virtually anyone else you care to name. A prolific creative force and innovator, his musical evolution has included recording everything from tribute albums to Jimi Hendrix and John Coltrane to straight-ahead jazz, funk and acid-jazz recordings. His inspired interpretation of an eclectic sampling of musical types explains in part his broad appeal and why he has been in constant demand from his earliest gigs to his most recent club appearances. Revered throughout the world and popular among many disparate groups, his unique stylings and prolific output have elevated him to the status of living musical icon.